How much do Google & Apple Maps change in a year? Coincidence or not, it was interesting. And it made me wonder what else would change, if we kept watching. Would Google keep adding detail? And would Apple, like Google, also start making changes? Let’s take a look at the final zoom on our San Francisco map pairs – which is a close-up of Patricia’s Green... here, Google has park paths and even some buildings and structures that Apple doesn’t have. And on Apple’s map, Patricia’s Green isn’t green. According to Google Analytics, that essay has received more than 1,000 hits from computers on Apple’s corporate network, mainly Apple’s Sunnyvale and Cupertino campuses. Yet nearly a year later, Patricia’s Green still isn’t green. So if Apple is dependent on TomTom for this kind of data, it would explain why the park hasn’t changed. There’s a lot of fluctuation: some places are added; others are removed. Places are added and removed almost monthly on Apple’s map. Do we see the same on Google? Similar to Apple, there’s a noticeable amount of churn. So it seems that Apple is updating its map more frequently than Google. A number of the additions and removals we counted earlier on Apple are similar – the map is cycling though businesses plotted at the same location. Google has been using computer vision and machine learning to extract business names and locations from the Street View imagery it has collected. And as of 2014, Google had already driven 99% of U.S. public roads. It’s likely this imagery has increased the accuracy of Google’s place data. And as we saw with Timbuk2 and La Boulangerie, this greater precision allows Google to fit more businesses on its map than Apple. And across all thirteen months, Google averaged 34 place labels per map, whereas Apple averaged just 30. Speaking of place labels, did you notice that halfway through the year, Google’s changed in appearance? What’s going on with Google Maps’s design? With everything Google has added over the years, you’d think the map would’ve become hopelessly cluttered. And yet that hasn’t been the case. As Google has added more and more datasets, it has continually rebalanced the colors, weights, and intensities of the items already on its map – each time increasing its map’s capacity for more. With a simple color tweak, the AOIs instantly became more legible. But while it was easy to understand why Google had changed the background colors, the motivations behind the other changes were less clear. It made little sense. Why was Google breaking its map? It just didn’t feel as Google-ly as before. And yet, a “cleaner” map seemed to be exactly Google’s aim. Google even said so, using the word “cleaner” three times in its blog post announcing the new design. The fixation on cleanliness was peculiar. But even more peculiar was the timing. Historically, Google has been cautious about cartography changes, never changing too much too quickly, and preferring small iterations over grand releases. And unlike Google’s prior redesigns, there was no press event, no mention of it at Google I/O (just two months earlier), no public or private beta, no Fast Company puff piece, no advance warning of any kind. Just a short blog post. It almost seemed as if Google thought it wasn’t a big change. A dramatic increase in place labels. 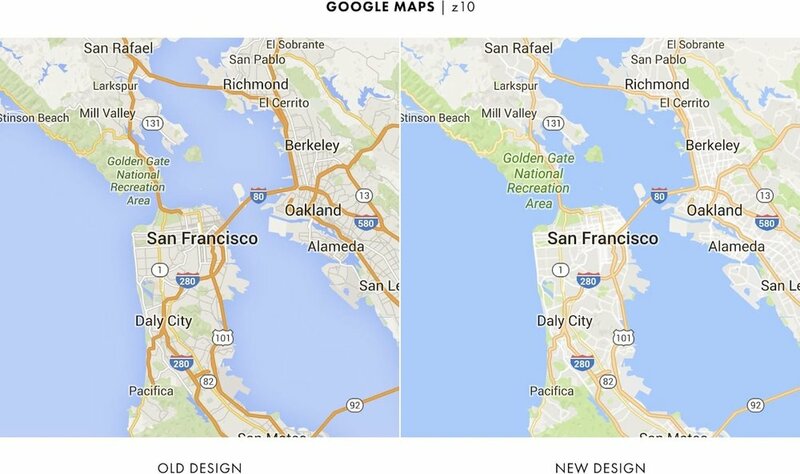 Over the course of a year, Google quietly turned its map inside-out – transforming it from a road map into a place map. A year ago, the roads were the most prominent part of the map – the thing you noticed first. Now, the places are. Now we see what was really happening last Summer: by bleaching and flattening the map, Google was clearing it for all the things it would add later. And last Summer’s redesign was just the first in a series of steps. It makes you wonder what else Google is planning. Interestingly, Google’s place icons are now even more like Apple’s. And speaking of places, Google has also been increasing the variety of places it shows. It’s quite a difference – and Google’s mix is now much closer to Apple’s. Speaking of Apple... while Google has been making all those changes, what has Apple been up to? After all, Apple announced an “all-new design” for Apple Maps just weeks before Google’s Summer redesign.